You spent hours slaving into the night on that vital report for work. But what happens if you forget to take it in the next day? Not much, really (apart from getting fired, perhaps), because short of going home again there's no way to access the data on your home PC. Give UltraVNC a try, though, and it could be a very different story. 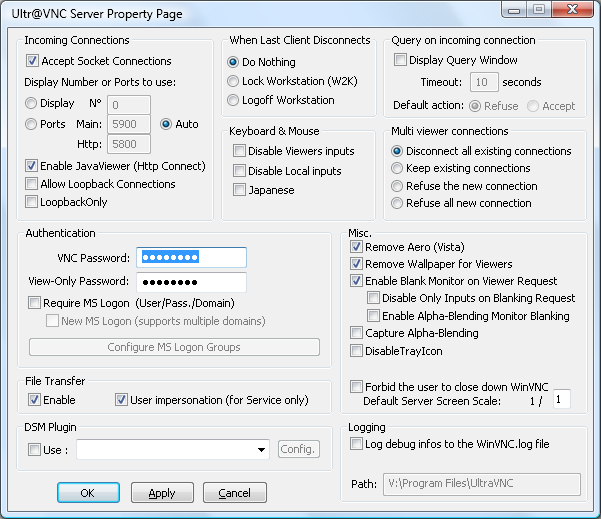 If you install the UltraVNC Server on your home PC, then leave it on and connected to the web, you'll be able to access the system from anywhere. So you could effectively log on to your home PC from work, then see your desktop, view documents, check your emails, and run programs as though you were sitting in front of the system. The program also allows embedded file transfer, which means you could locate that missing report (or any other document you need), then send it across to your current location in just a few clicks. Built-in compression will help keep transfer times to the minimum. UltraVNC is the perfect way to provide access to your PC from anywhere, then, but it has other applications, too. If you've a friend who's always getting into PC problems, for instance, then the program can help you access and control their system. You'll be able to browse their settings, make Control Panel tweaks, and hopefully fix their PC without having to go round and do it in person. And businesses can take this even further by using UltraVNC for remote support, letting them connect to customers to help set up and optimise their systems. There are many competing services that do similar things, of course, but UltraVNC has a lot to recommend it. It works on just about any version of Windows, can automatically configure itself for easy connections, and best of all, is really, really fast. A special video driver ensures the view of your remote PC is updated very quickly, almost in real time, with none of the annoying drag and delay you see with many remote control alternatives.